Central Rovers were crowned league 3 Champions for this season following their 6-0 home victory over Los Zarcos on Saturday. They have now reached 43 points which puts them beyond the reach of Temple who are in second place with 36 points and two games left. Congrats to Manager Stephen and the lads. Champions of league 3 for season 2016-17 CENTRAL ROVERS. County Cup Semi-Final: Buttevant v Tower FC, Buttevant, 6.30pm, D. Fogarty. AUL 1: Buttevant v Strand, Buttevant, 6.30pm. D. Fogarty. 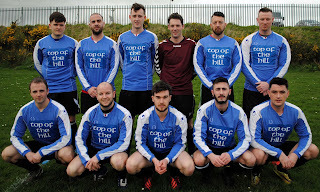 County Cup Semi-Final: Rathcoole Rovers v Tower FC, Rathcoole, 2pm, M O’Flaherty. AUL 1: Cloughduv Celtic v Rathcoole Rovers, Fr. O’Driscoll Park, 2pm, M O’Flaherty.